Where does Ipplepen ﬁt in the Roman Empire? What can the environment tell us about ancient life at Ipplepen? Mary Pollinzi Brown on Thank you to our week two volunteers, and ‘Hello’ to our visitor from Dallas! Here’s the third of our intern Sophie’s blogs. Sophie is on hand to talk to visitors at the Hub, Ipplepen Methodist Church, East St, Ipplepen until Thursday 29th June, 4pm. When the Romans landed in AD 43 they had a large impact upon many places in Britain. However, up until recently scholars in Romano-British history had not thought that Devon was to be included in these places. It was widely agreed that Devon was not largely affected by the Roman rule and it was assumed that the army had not ventured much past Exeter (Roman Isca Dumnoniorum). This meant that the inhabitants of Devon, unlike those of London, York and Colchester (where the presence of the Roman military was keenly felt), were assumed to live in a simpler and more traditional manner. However, after the discovery of Ipplepen all of these assumptions are now being challenged. One of the most striking features of Ipplepen is the degree it shows of Roman inﬂuence. For instance to date around 150 Roman coins have been recorded. The coins range from a Republican denarius of 49 BC to a nummi of Arcadius, dating to AD 383-408. 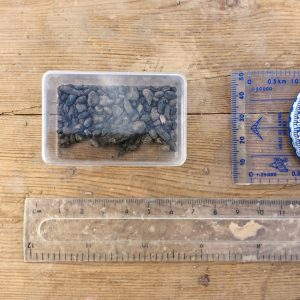 Coins are usually rare in Devon and Cornwall, so much so that it was the concentrated presence of these coins which prompted further investigation which has now turned into the excavation. These coins not only show the Roman inﬂuence present in Ipplepen, but also that Ipplepen was part of the wider Roman economy, stretching all the way back to Rome itself. quality of the earlier phases of the road as well as the associated time mean that the road can be used to see civic and ofﬁcial activity in the area, hinting at the importance of the area. Lastly, but not at all least, comes the Roman style of pottery found in Ipplepen. 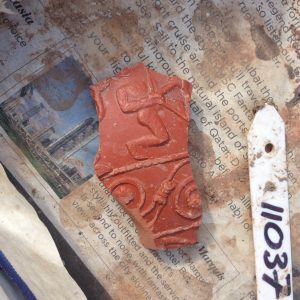 Not only can local ware be found on site but also ﬁner examples of Samian ware which is of a higher quality and imported from the continent. Near to the road was found a large un-abraded sherd of imported Samian ware (AD 1st-2nd century). This was stamped with a makers mark, AUC, which archaeologists were able to trace back to France AD 150-180. Together with the amphora, the pottery evidence shows that luxury goods were being imported from the continent and the wider Roman empire. This leads to the assumption that at least some people living at Ipplepen developed Roman tastes and had the means to import luxury goods from far aﬁeld. Although some of the features of Ipplepen are more commonplace in other parts of the country, it is the very fact that they appear in a landscape so far west that makes them so groundbreaking. Though Ipplepen is on the periphery of what was once the province of Britannia it can be seen that they very much participated in the Roman empire, both culturally and economically. As Danielle Wootton has said “Until recently, who would have thought that Ipplepen village was once ‘plugged in’ to the Roman empire?”! Posted on 28th June 2017 19th December 2017 Author WoottonCategories 2017Leave a comment on Where does Ipplepen ﬁt in the Roman Empire? 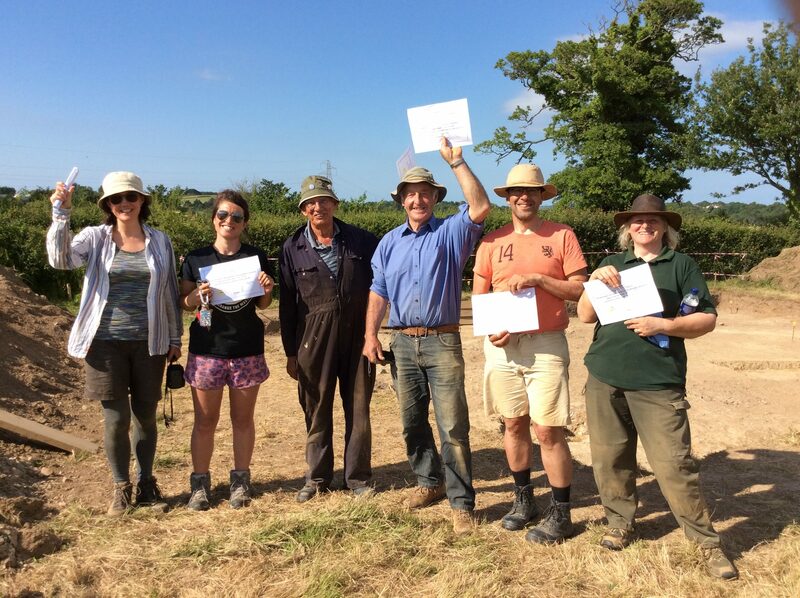 We’re starting the last week of the dig with an exciting and incredibly rare find for Devon! This pottery sherd is likely to be a type of Romano-British pottery known as “South East Glazed Ware”. It’s thought to have been produced in South East England in the later 1st and 2nd centuries AD. We are currently consulting pottery specialists for further identification but so far we think that this is possibly the furthest in the South West ever that this glazed type of pottery has been found. Archaeologists have sent the sherd over to the Hub today so members of the public can see this rare find. It will be on display until Thursday 29th at Ipplepen Methodist Church on East St, Ipplepen. Don’t miss out on your chance to see it fresh out of the ground! Isca Romans on the Roman road excavated in 2015. We’re looking forward to seeing everyone at our open day tomorrow (Sunday 25th June, 10.30am to 3.30pm)! 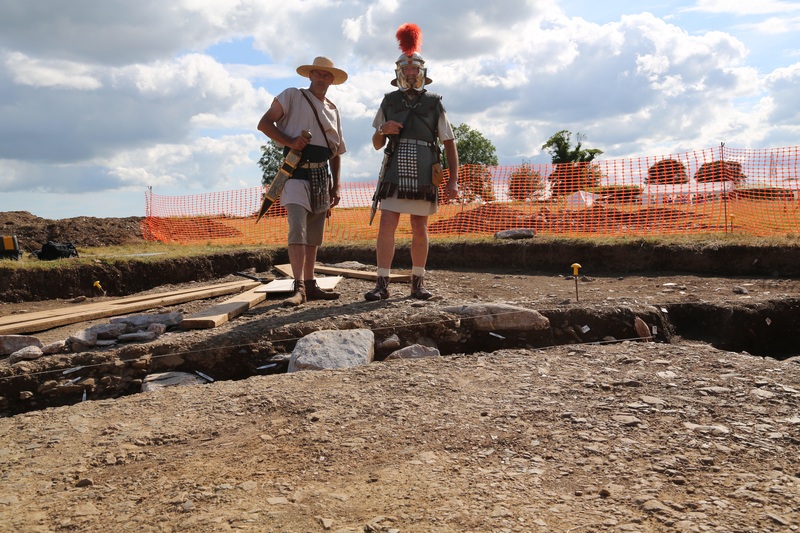 There will be guided tours of the excavation, children’s activities, refreshments, history- related stalls, and Roman re-enactors from Isca Romans and the Vicus- who will be celebrating the Roman festival of Fors Fortuna! -The excavation is in a privately owned field and the landowner has very kindly given permission for public access only between 10.30 and 3.30 on Sunday 25th June 2017. -Please try to car share if you can, to limit the amount of parked cars in the landowner’s field. – Please note that the ground is uneven, we are exposed to the elements, and there are no facilities (although we do have a limited number of portaloos). -Please wear sturdy footwear and outdoor clothing appropriate for the weather including waterproofs and sunhats etc. Here’s the second of Sophie’s blog posts. Sophie is our intern who is based at the Hub in Ipplepen Methodist Church weekdays from 10am to 4pm until 29th June 2017. Do drop in to find out more about this year’s excavation. The historic landscape is a term used to describe the environment that Ipplepen’s inhabitants would have lived within in the past. There are many ways in which modern archaeologists can attempt to rebuild this environment with one of the most common being to study the remains of agriculture such as seeds from ancient crops and animal bone which have been preserved. Crops, the most common being various kinds of wheat, barley and oats, can be used to shed light on many things in the ancient world. They can be used to show trends in popular foods, tastes and preferences within communities, and even soil conditions and therefore the state of the environment at the time in which they were grown. For example, wheat, though the most common crop is also the least tolerant to poor soil conditions and waterlogging. It is therefore uncommon to ﬁnd large amounts of it anywhere with thin, or exhausted soil. Barley is a little more tolerant and so may be found in a wider variety of conditions but it is oats, tolerant of both bad soil quality and saline conditions, which can be grown almost anywhere. they even survive at all. This makes it difﬁcult to identify them with certainty. Seeds are often only preserved through accidental charring, such as if they were dropped into ﬁre accidentally during cooking. As such it is impossible to be sure just how representative of daily life our assemblages are. 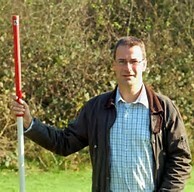 But this doesn’t mean that there has been a lack of environmental data found at the Ipplepen site! Though seeds have been found before on this site it was in 2016 when their collection really took off. Through the painstaking efforts of students and volunteers alike who went through dirt samples by hand (armed only with a paintbrush and a pair of tweezers!) hundreds of examples were found, whilst the excavators carefully removed and bagged all possible animal bone evidence. Though full assemblages from the site are not yet available both wheat and cow bones have been found which carries interesting implications for how Ipplepen ﬁts into the wider Romano-British landscape. If you’re interested in ﬁnding out more come and visit the Hub before the 29th of June and bring any questions you have with you!! Posted on 23rd June 2017 19th December 2017 Author WoottonCategories 2017Leave a comment on What can the environment tell us about ancient life at Ipplepen? After last week’s rain, we experienced scorching-hot weather on site during week two of our excavation. 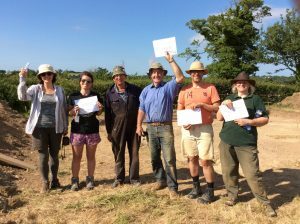 Nevertheless, our team of students and volunteers persevered and we are beginning to piece together more clues of what life was like at the settlement at Ipplepen. 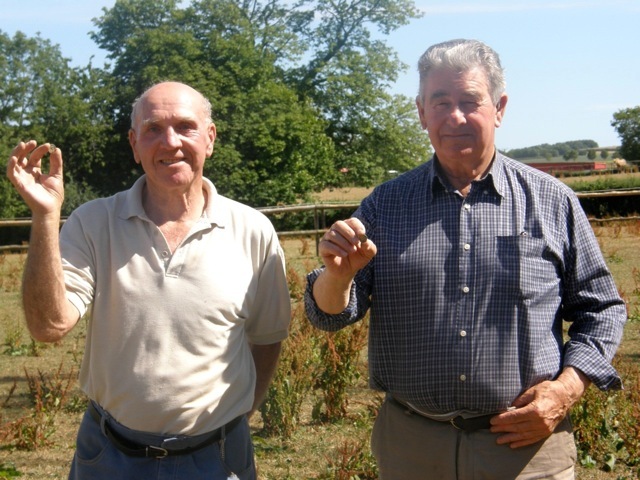 Thanks to radiocarbon dates taken last year, we now know that there was activity at our site since at least the middle Iron Age, and this activity continues in the Romano-British period- and beyond- into the Early Medieval period (sometimes referred to as the ‘dark ages’). This makes our site the longest period of activity currently known in Devon! On Friday, Professor Stephen Rippon gave a site tour to students and volunteers of our findings on the excavation so far. The three trenches (trenches 13, 14, and 15) that we are currently excavating have all brought up Roman pottery. Some of this pottery has been made in Britain, but much of it has been imported from the Mediterranean area. These imported wares include fragments of amphorae- large storage jars containing goods such as olive oil and wine, and Samian ware- ‘fancy’ decorated table ware. 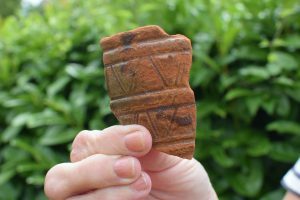 This type of imported pottery suggests that the inhabitants at Ipplepen were very much connected to the Roman world. In trench 13, we have discovered the remains of a curvilinear ditch- which is probably a ‘ring ditch’ associated with a roundhouse. A ditch was often dug around the outside of a roundhouse so that the rain would soak away into it, in order to prevent the floors of the house itself becoming damp and muddy. As roundhouses were made of organic materials (thatched roofs, wattle and daub walls) which do not survive, often the only indicator of a roundhouse is the deep ditch which was cut out around the house. Also in trench 13, there is at least one deep pit- not yet fully excavated -which might possibly be a well for water (watch this space!). In the same trench, we have discovered four post holes in a square shape, measuring about 1m square so there is a working hypothesis that this might indicate a store for grain, (termed a ‘granary’). Granaries were often raised above the ground (a bit like a very large roofed bird table- but four posts instead of one!) which would prevent rats and mice from getting in and eating the food supplies. 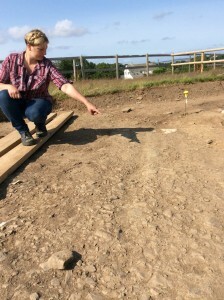 In trench 14, there are several linear ditches which contain pottery dating from the Roman period. One of the ditches contains a lot of charcoal, so we hope to be able to take some radiocarbon dates, which would date the fill of the ditch. In other ditches and pits, we have found lots of iron working slag. Finding so much iron slag demonstrates that there must have been some industrial processing activities carried out nearby. 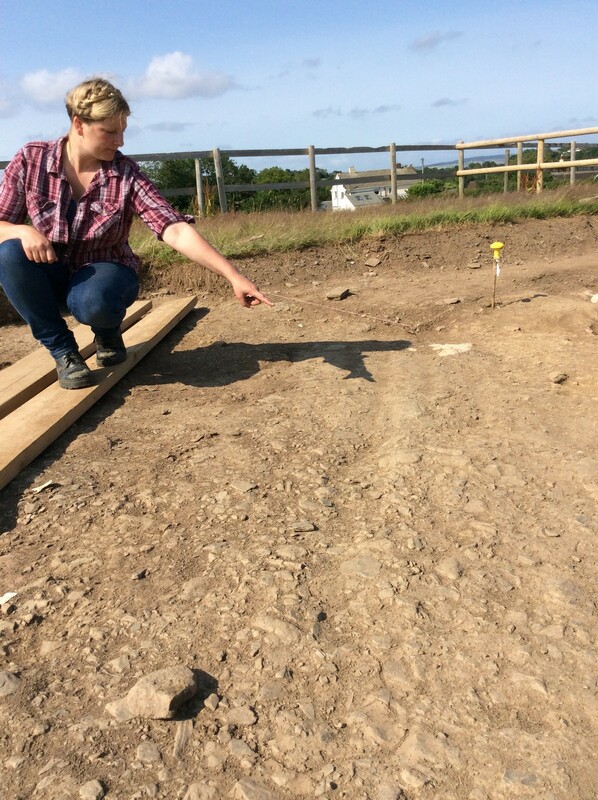 In trench 15, we have discovered two linear ditches which might possibly represent two ditches either side of a trackway (similar to ditches often seen on Devon country lanes today). Unlike the nearby robust Roman road we excavated in 2014 and 2015, this does not have a metalled surface, and was unlikely to be a ‘major’ routeway, but possibly served the local community of people living at the settlement. We still have another two weeks to excavate so our interpretations (and dating) of the various features we have might change over the next few weeks- but we are certain that we are finding more evidence of Roman trade and influence, that we have uncovered another roundhouse and, due to the presence of iron slag, have some form of iron working nearby. We are probably looking at many phases of settlement spanning hundreds of years. However, from our finds so far this season, one might start to imagine everyday life at this multi-period settlement- people digging ditches to keep the rain out of their house; storing grain above the ground so that it isn’t eaten by rodents; making iron for tools such as spades to dig drainage ditches around houses, or perhaps making iron ploughs to furrow fields in which to grow grain or scythes to cut silage; using trackways to herd animals, or to walk along – maybe to visit family and friends whilst taking with them imported wine or olives in amphorae to celebrate a special occasion! To find out more about the site visit our excavation open day on Sunday 25th June, 10.30am to 3.30pm. 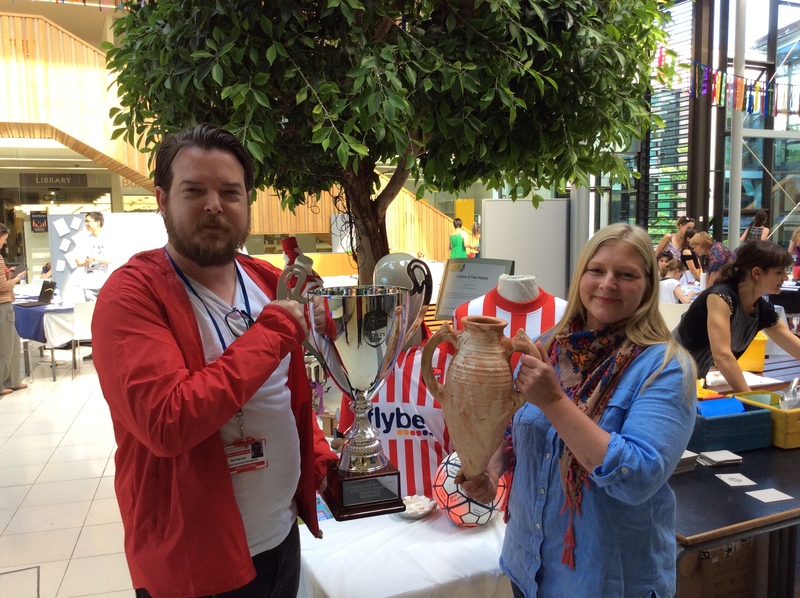 On Saturday 17th June, Chris Smart and Danielle Wootton attended the ‘Think-Art’ family open day organised by the University of Exeter Arts and Culture team, which was organised as part of the University’s ‘The Observatory’ exhibition (details below). Alongside some beautiful, amazing and thought-provoking artwork by artists, we displayed brilliant community paintings made by pupils from both Ipplepen and Abbotskerswell Primary Schools, pottery from Sands Secondary School in Ashburton, and our dig ‘mascots’ painted by Ipplepen Dramatic Society’s set painters. The day was very inspiring and it was a great opportunity to engage with the different research projects taking place across the University as well as having the opportunity to talk to the public about our exciting excavation and forthcoming open day. The Observatory: perspectives on landscape, society and spirit is an exhibition of artistic responses to the key research themes of the University. The University is a place of learning and also a place of research. Artists from across the region were invited to submit works for this exhibition that respond to the idea of ‘observatory’ as a channel for exploring a certain type of vision, investigation or view. 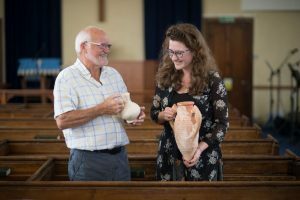 The theme is open to interpretation and artists explored and investigated specific areas of research at the University of Exeter as inspiration for their work. The University’s research takes placed in teams combining a wide variety of topics from the distant reaches of the universe, to conditions in our own localities or our own minds, bodies and societies. This free exhibition showcases selected works from those submitted, reflecting the diversity of research at the University. Thank you to our week two volunteers, and ‘Hello’ to our visitor from Dallas! A big thank you to all our volunteers this week- it’s been hard work in the hot weather but everyone said they’d had a great time. We hope to see you again soon! Also, today we had a special visitor from Dallas- Dr Kristen Leith’s mum! 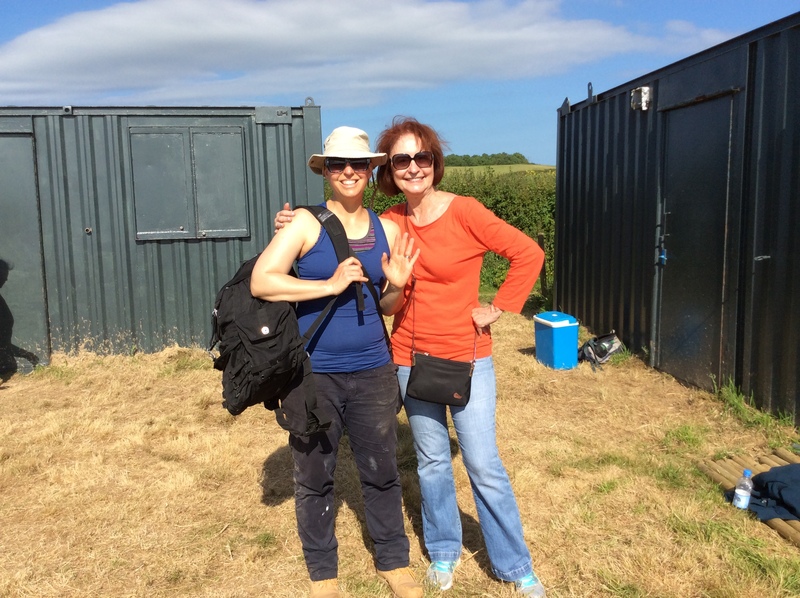 It was her first time visiting an excavation- we hope you enjoyed your day with us! Posted on 16th June 2017 19th December 2017 Author WoottonCategories 20171 Comment on Thank you to our week two volunteers, and ‘Hello’ to our visitor from Dallas! Here’s a blog from our Hub Intern Sophie Pallett. Sophie is on hand to discuss the site with visitors at the Archaeology Information Point at the Hub, Ippelpen Methodist Church, East St, Mondays to Fridays 10am – 4pm until 29th June 2017. On Sunday two Young Archaeologists Clubs visited the site for the day. 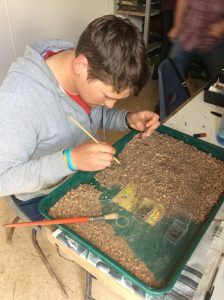 Members, parents and group leaders of both the Torbay Club and Somerset MAYA (Mick Aston’s Young Archaeologists) Club were given a site tour by John Davey and then divided into three rotating groups to help with various archaeological tasks. 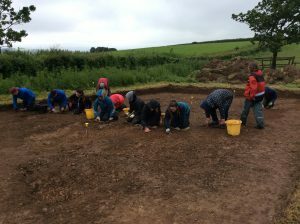 Under the supervision of John Davey, the Young Archaeologists brushed up on their troweling skills and helped to clean back an area in Trench 14. With Kristen Leith, the group sieved the spoil using hand sieves to look for any finds in the topsoil which might have been removed by the machine in the first week. With Danielle Wootton, the groups then looked at replica Roman pottery in order to learn about different pottery types and then helped to wash the finds, and to sort pottery sherds by type. Members from both Clubs were very enthusiastic and said they’d had a fantastic day. Thank you everyone- we hope to see some of you at our open day on the 25th June! 9th June update- 115 Hub visitors in our first week! The weather was much kinder to us on Friday so the team were able to continue the task of cleaning and planning Trenches 13, 14 and 15. Archaeological features are now visible in all three trenches and the next task will be to begin excavating them in order to understand their function, date and how they relate to each other. Trench 13 contains a curvilinear feature which may be a ring ditch associated with Iron Age activity. There is a spread of rubble in trench 14 which is being carefully cleaned, and trench 15 contains many amorphous features which need to be excavated before we can further understand their age and purpose. Professor Stephen Rippon gave a site tour to students and volunteers on Friday afternoon which enabled everyone the opportunity to see how each trench was developing. Meanwhile in the Hub, we welcomed 115 visitors in the first week! 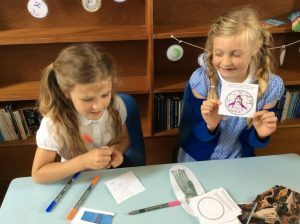 On Friday afternoon we were visited by families from the after school club and children designed their own Roman coin to go on display. One of the youngsters commented ‘Ipplepen is a small place- who would have thought there’d be SO MUCH history!’. Danielle Wootton then showed the headmaster of Abbotskerswell Primary school around site in preparation for their visit to the excavation. We look forward meeting more visitors in the Hub next week! 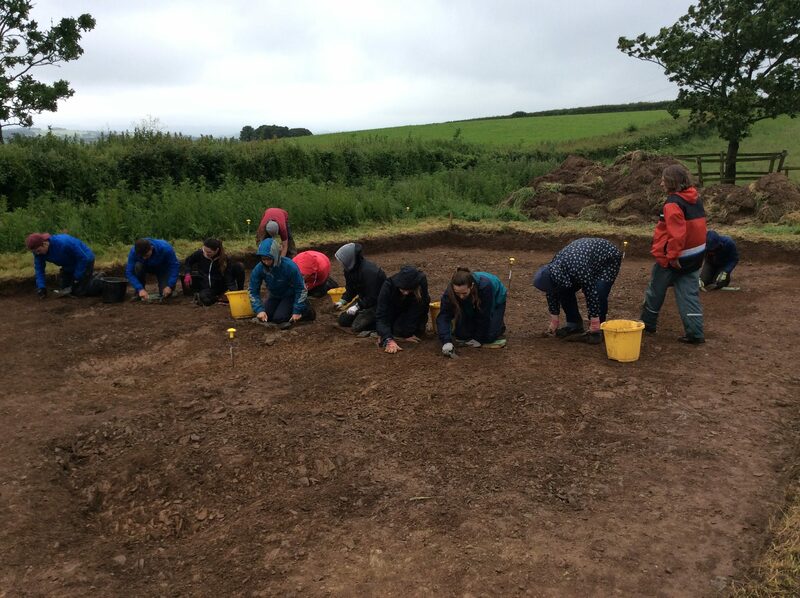 A special mention and a big ‘thank you’ to all the volunteers who helped on the excavation in week one- we hope you enjoyed your time with us and look forward to showing you our progress at the open day on June 25th. Posted on 11th June 2017 19th December 2017 Author WoottonCategories 2017Leave a comment on 9th June update- 115 Hub visitors in our first week!